August, 2015.- we created the first large change in the app. The app now is able to use not only mrad's and moa's but also "divisions" which is the result of modifying the angular subtension of your 2nd focal plane reticle by the magnification, regardless of whether they are MOA or mrads. The app now includes Sightron's Mil-Hash, MOA and MOA-H reticles. - we incorporated the Vortex Optics DH/BDC reticle. - the app can now EMail a .CSV file to your registered EMail. - we incorporated the DU-Line reticle by AEON! 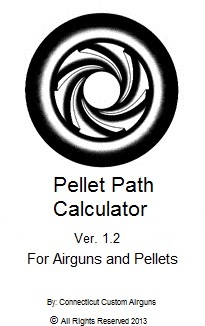 Pellet Path Calculator (PP Calc for short) is the ONLY ballistics program that does NOT require the input of a Ballistic Coefficient (BC). Rather, it derives the BC from basic, approximate data. PP Calc was born from the need of all good Spring-Piston shooters to face the inevitable variations that the trajectory of their projectiles suffer when changing venues. Spring-Piston airguns, and to lesser extents some PCP's, are subject to the vagaries of air temperature, humidity, atmospheric pressure and other environmental variables that change the pellet's trajectory. Trying to simulate all those variables would be an exercise in frustration, as there is not even a real, practical way of measuring them. My Grandfather used to say: "Never argue with reality", and so following his maxim, this "Ballistic Application" is really different. PP-Calc takes a few basic approximate data and then takes your input as regards the real trajectory of your pellet to come up with a complete set of ballistic tables, graphs, charts and numbers that will fulfill any shooter's needs for precision and accuracy. "Garbage in will mean garbage out". So, let's walk through the app and let me tell you what it does and how. When you first purchase the app, from Google Play, you will need to setup the app to YOU. You need to start by going to "Tools", then to "Settings". Once you are in "Settings" you need to type your name and decide how you want to use the app. -Do you want to display the inclinometer? (Do this in a competition ONLY if you have checked with the Match Director that it is OK to use an external inclinometer. If the MD has ANY qualms about it, do not display it. Get a rifle mounted inclinometer. In this "Tools" section is where we have located the "Panic" button. It is the red button at the lower section of the screen that says: "Return to Factory Settings". Use this ONLY if you have messed up EVERYTHING. If you have not messed up everything, the app is very forgiving and will allow you to correct bit by bit till you are getting the results you wanted (assuming you have given the needed information!). Once you have done this, you can move back to the initial screen and create your first "User File", ¿how? Just touch the top left button that says: "User Files"! You will then touch the line where the basic file name has been written and you will write the name of the user file you want to create. Even though, USUALLY, in app terms "User" means the person, I would suggest you use for the User File name the combination of the shooter's name, the rifle and the scope. With these three items the shooting system is perfectly defined. Rifle change will mean a different "User File", a scope change will also mean a new User File. That is OK, you can create lots and lots of User Files for all your toys in all the possible combinations. If you shoot in more than one venue, that is also worthwhile of creating another User File. That tells me everything I need to know about that User File. So, you will create a User File by clicking the "Add" button and you will then "Select" it by highlighting it and touching the "Select" button in the dialog box. You can also add notes to EVERY User File. But that will come later, when you have more experience with the app and you can drive it to its best performance. Once you have created the User File for the system, you will need to go back to the Main Screen and you will choose "Data Input". 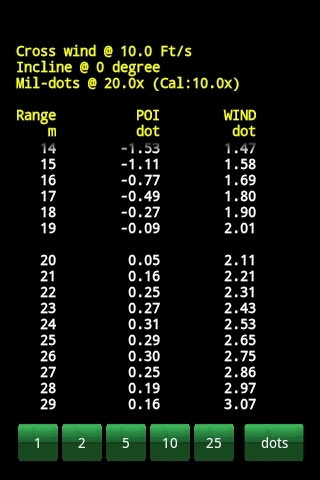 The Data Input screen will allow you to enter the basic System data as well as the Trajectory Data you need in order to develop the rest of the trajectory, the windage table, graph and chart, and to solve, through "fuzzy logic" equations, your system's ballistics. So, what is the basic 'System Data'? You start by inputting an estimated MV, you can input it in Ft/s or in m/s, the app will do all necessary conversions on the fly. Green button to the left of the input box toggles the units in all cases for this screen. You then need to input the Scope Height. This only needs to be an approximate number, you can measure it from center of barrel to center of scope tube. Units can be either cms. or inches. Your choice. 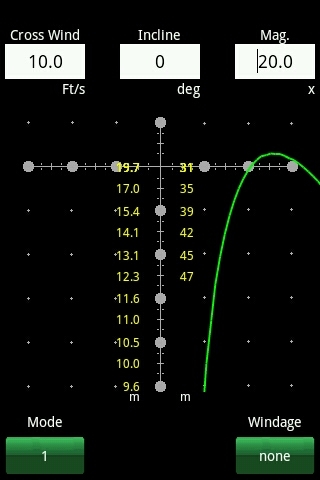 Since the REAL scope height is measured at the MUZZLE, you can come back later to correct this number using the graphs the app provides. 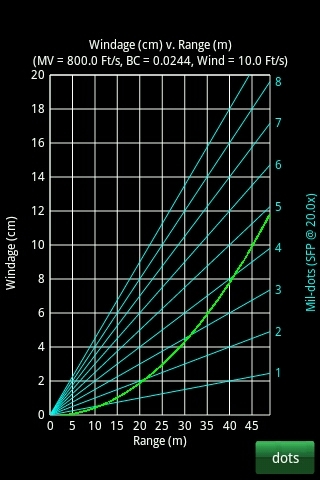 After that you need to establish what will be your "basic wind", this is understood by the app as being the full value component of the cross wind (that is perpendicular to the pellet's line of flight). It can be expressed in km/h, Ft/s, MPH, or m/s; whatever you feel most comfortable estimating in the field with. And last of the System's inputs is the pellet weight. This only plays a role in the calculation of the energy, so an approximate value is more than enough unless you are shooting under some rules that require a maximum energy and then you need to ensure that you will be legal. The App will not do this for you. Now you need to tell the app what sort of scope you have. The App is basically designed to be MOST helpful to shooters that use the bracketing and come-ups system most used in military sniping. Scope will need to be defined for the app so that the app knows if it is a Mil-Dot reticle, or a 1/2 mil dot, or some other reticle, and whether the reticle is located in the first or second focal plane; and if it is second focal plane, at what magnification is the reticle "true", and at what magnification you are using the scope. Selecting the right reticle will automatically put in the correct numbers for click value, calibration magnification and units. You will still be responsible for checking that the NOMINAL click value is what you have in YOUR scope. Not always the case. If you are not using the come-ups and hold-offs, but you are clicking, now is the time to check that the subtension of your clicks is real. In this case, you only have to be consistent between clicks and drops. If you want to use cms or inches for the groups' drops in relation to the LOS, then you need to ALSO measure what is the true click value. The best way to do this is to put a chart with lines that are multiples of 1.047" at a good distance (25, 50 or 100 yards) and then, after carefully placing the crosshairs at the beginning of a line, counting the clicks till the crosshairs come to the other end of the line. For example: If you draw a thick line that is 4.188" long, and then place the paper at an accurate 25 yards, that line will have 16 MOA's in length. If you need to use 66 clicks to go from one end to the other, then your scope has a click of 0.24 MOA PER CLICK, or 4.125 CLICKS PER MOA, which is what the app wants to know. 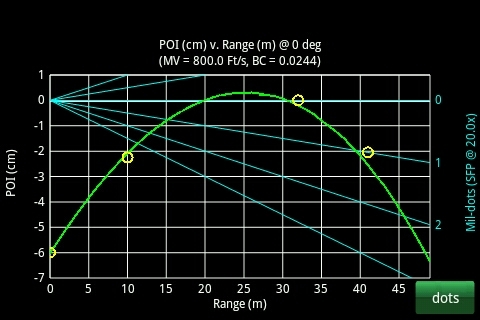 The app also needs to know if the scope is first or second focal plane so that it can display the trajectories in dots (that takes into account the difference between used magnification and calibration magnification) OR mils, that are true always as an angular measurement, but will not always coincide with a badly made reticle or a low quality scope. You need to shoot THREE groups at different ranges. I like to shoot ten shot groups and then measure the CENTER of the group as the average performance at that range. I also like to use the FAR zero as the setup zero, then shoot one group at the farthest range I will need to shoot (usually for FT competitions, 50 meters) , another group at the average between the farthest group and the far zero (in my case usually something like 41 meters) and only as last group, will I shoot a group at the NEAREST distance I will shoot (in WFTF competitions, this can go to 8-9 meters). Once you shoot your groups, you can enter the DROP from LOS to the CENTER of the group. You can enter this in cms. ; inches; mils; MOA's; or Divisions ("Divs" for those scopes that have their reticules installed in the second focal plane). I generally use the "Divs", as that allows me to do all the measuring without retrieving the paper targets. Once you think you have done what you should do, then push the button "Calc" at the bottom of the screen. This will take you to an "Errors" page that will tell you how consistent your data is. The screen will display the BC for each tranche of the trajectory (between each range set), and will display what is the weighted average. The bottom half of the screen is a section that floats and displays the "errors" between what the app WOULD have calculated using the weighted average BC and the inputs YOU provided. I like it when the errors are less than 0.5 cms, and even like it more when the errors are of the order of a few milimiters (0.1 -> 0.2 cms) for all distances. This is not always possible, but that is what you should strive for. When you reach that point it means that you are not only holding and shooting consistently, it also means that your data is a high quality set of data to be trusted. In any event, once you have a good set of data, then you need to set the bottom left hand button of the input screen to the unit YOU want the app to generate all the results in, it can be Divs, Mils, Clicks, or MOA's. Use whatever is best for YOU. You can use "Tables", and that will display the trajectory in a table form expressing the drop from LOS as negative numbers and the overshot from LOS as positive numbers. Negative numbers mean a come-up and positive numbers mean a come-down with the scope reticule. The first table also displays the windage for the basic value you chose. I like to use 5 km/h because I am used at judging the wind with those units, but if you are teaching yourself to read the wind using a Kestrel, you may need to change that into other units you feel more comfortable with. At the bottom of this screen you can choose how closely together you need the values displayed, you can choose between 1, 2, 5, 10 and 25 units of length. For FT I choose always to have EVERY meter displayed. You can also choose the units to be used in the display with the units button at the lower right corner of the screen. Again, you can choose between clicks, MOA's, mils, dots, and cms. Swiping the screen will bring another table: the Velocity / Energy table. MOST of the times, the first table is all you will need (drop and windage), but the app also creates other presentations for other styles of shooting. If you go back to the initial screen, you can choose to display the results also as a "Reticle". The Reticle screen has three modes, where you can choose to see or not see the windage. Most useful to me is mode 1. In this mode you will see the path of the pellet assuming a full wind blowing. 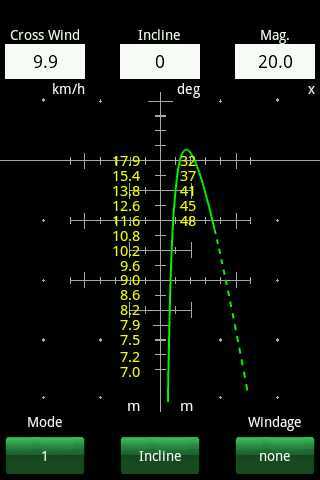 In the reticle screen is where the inclinometer is located. If it is active, then a green button will appear at the lower central portion, if it does not appear is that you do not have the inclinometer active. Whether you have it active or not, the screen still allows you to ENTER an inclination that you read from a rifle mounted inclinometer or estimate by eye. The app will then change Tables, Graphs and Charts to reflect the incline you have input. After taking the inclined shot, you can then reset the incline to zero. The Reticle screen is also where you can change the magnification you are shooting at, and you can also choose to see the numbers for the windage displayed or not. Once you are familiar with the reticle screen I doubt you will ever need a different screen, but we try to cater to all types of shooters, and for those that like to know more about their trajectories, we developed the Graphs section. The yellow circles is the location of your groups in relation to the calculated trajectory. If your circles are way off the curve, then you need to re-shoot your test groups and come up with better data. Since most of these graphs display somewhat specialized data, we will not delve into them, but they are there for the connoiseur. Developing the app has been a pleasure and I have learned to be humble and accept that sometimes my data is better than others. So that puts me into "competition mode" because I am more aware of my surroundings, the light, the wind, the inclines, and all the other challenges to a well placed shot. For those people that hunt a lot, it is far easier to get to the field a little early, create a new User File, shoot some test groups and then save the results so that if you return to that same spot, you can recall those results. Airguns are marvelously reliable tools for hunting, shooting and pest control, but they do REQUIRE a high level of precision and accuracy. Now anyone can attain the knowledge of their trajectories with as little data as is mathematically possible that will produce the required precision. It is up to the shooter and his system to ensure that with the knowledge and the precision, the system will deliver the accuracy.